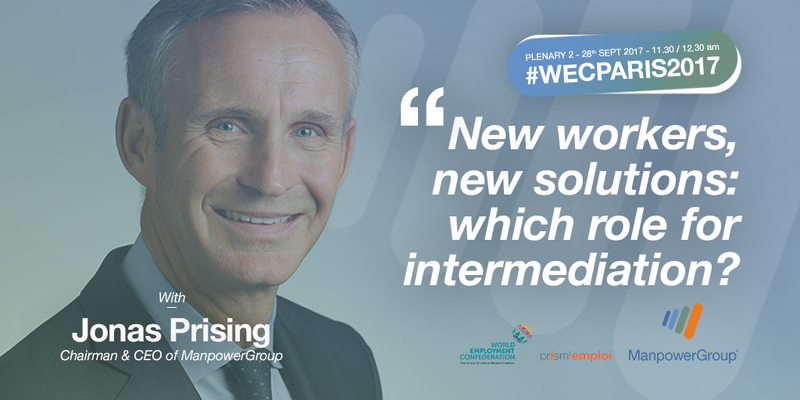 ManpowerGroup Chairman & CEO Jonas Prising will share insight on the future of work and what workers want in a panel discussion on New Workers, New Solutions at the World Employment Confederation (WEC) fiftieth anniversary conference in Paris. ManpowerGroup joins the ILO, policy makers and the OECD in Paris to discuss Labor Market Dynamics in the Digital Age. The World Employment Confederation (WEC) is the international confederation of the HR services industry with representation in 50 countries. WEC brings together policy makers, labor market specialists, HR Solutions Companies and other stakeholders. ManpowerGroup was a founding member when The World Employment Confederation (then CIETT) was formed fifty years ago in France, ManpowerGroup's largest country business. "The labor market is changing rapidly - we see the latest example here in France with President Macron's current plans to reform the French labor market and his effort to get more people into employment," said Jonas Prising ManpowerGroup Chairman & CEO. "The Next Generation of work will look different to the past. People and business want new ways to get work done. It's time to shift the discussion from old regulation and prevention to action: companies need to better understand how people want to participate and meet them where they are, with what they want. Five decades since the formation of WEC, our commitment to enabling flexibility for employers and providing meaningful and sustainable work for individuals is more relevant than ever." Jonas Prising will join Denis Pennel , the Managing Director of WEC, business leaders from organizations including PWC and IKEA and labor market experts from the ILO and OECD to consider practical solutions for labor markets, skills development and social policy in a rapidly changing world of work. The future of work is bright. more than 90% of employers expect their organization to be impacted by digitization in the next two years, and most expect a net gain in employment. 83% intend to maintain or increase their headcount and upskill their people. What people want is changing. They are working longer, learning more and now seeking a better balance between work and home. Not everyone wants to engage as a full-time employee and organizations don't always want that either. The 'Monday-Friday 9-5 job for life' has moved on and much of the jobs growth over the last 10-15 years has occurred in new, alternative ways of working. Employers are not always able to predict the skills they will need in the future. ManpowerGroup has mapped future skill needs in high growth sectors like digital manufacturing in partnership with the Digital Manufacturing Design Innovation Institute (DMDII), identifying 160 roles and emerging skills. ManpowerGroup is also partnering with employers including Dallara and Rockwell to provide workers with opportunities to skill up in in-demand sectors. The World Employment Confederation is the voice of the employment industry at the global level, uniting labour market enablers from 50 countries and 8 of the largest international workforce solutions and brings access to and engagement with international policymakers (ILO, OECD, World Bank, IMF, IOM, EU) and stakeholders (IOE, trade unions, academic world, think tanks, NGOs). The World Employment Confederation strives for recognition of the economic and social role played by the employment industry in enabling work, adaptation, security and prosperity in our societies. In a fast changing world of work, the enabling functions provided by the employment industry is more important than ever (http://changingworld.work/). Thanks to its network of 169 000 employment agencies and 1.5 million HR specialists, the employment industry has been shaping the world of work since 1967.